…these places have created an electro-magnetic loop with wire around the perimeter of the room, connected to an amplifier and the public address system. 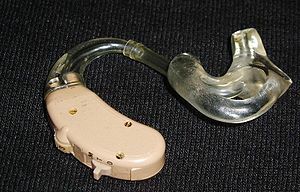 When a person with a hearing aid flips a tiny switch to the telecoil setting, he or she can hear what’s being said into the microphones without any background noise. This appears to use inductive technology – the same concept that makes a transformer work. Essentially, the building in which you’re sitting becomes the primary winding, and the coil in your hearing aid, the secondary. It represents a major step forward in providing access to HoH individuals who can benefit from hearing aids. Posted in News.Tagged #JusticeForFelix, Background noise, BitcoDavid, Deaf in Prison, DeafInPrison.com, Hearing aid, Hearing and Listening Aids, Inductive technology, Looping, Transformers.